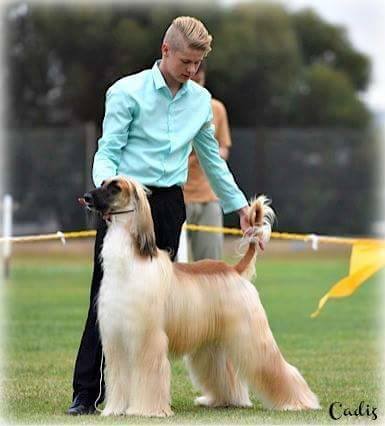 Welcome to our site where you will see some of our Afghan Hounds. We always strive for the betterment of our pedigree breeding programe. Occasionally we may have a litter. Located on the Adelaide Plains 20 minutes from the Barossa Valley in South Australia. Photograph is of William and his dog 'Rafale' Champion Cadiz Gold Rush, he titled along with his litter sister after he titled him. William is a very special young man who has taken to showing dogs only a couple of years ago and is doing an amazing job with the Afghans and many other breeds he handles for people. I decided to breed Afghans under the Cadiz prefix in 2003. Cadiz Kennels have shown, bred AND owned Best in Show winning dogs. sister BIS Ch Tahkira Hells Angel(Dam of T Hell Raiser) Ch Tahkira Tiger Talk and the stunning litter brother to Am Gd Ch Aus Ch. Tahkira Hell Raiser Ch. Tahkira Sheer Hell. Whilst I have limited time to show my Afghans, as my time is very much taken up with the Cresteds, William Mackander, pictured above with Rafale is taking the showing of the Afghans very seriously having titled two Afghans from the same litter and will be showing another in the near future. William is also loving and showing a Tahkira dog Lenny. As time permits, I will be adding more about Wills team soon.